Lobanovskyi was always an intense, fierce coach and a strict disciplinarian aspiring to control every aspect of his players’ life both on and off field. But he still was a genuine lover of the game, an aesthete, ever looking not just for victories but also worrying about the way to achieve them. Some could argue this way by citing Dynamo Kyiv’s 3-0 victory over Atlético Madrid in the Cup Winners’ Cup final 30 years ago, but his 1986 World Cup and 1988 Euro USSR teams are the ones where Lobanovskyi’s coaching philosophy reached its top. In typical Lobanovskyi fashion, USSR’s shape in possession was linked with strong collective structure and well-coordinated movement. 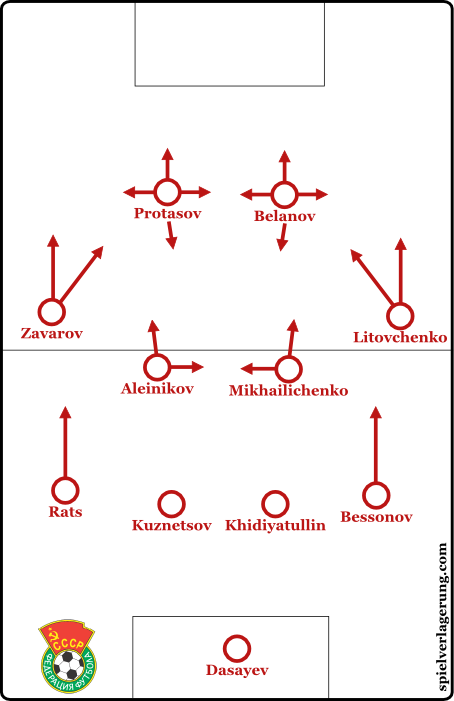 Lobanovskyi wanted his players to strictly follow his tactics, putting emphasis on a quick, vertical playing approach. After a spell as the team’s assistant coach, Lobanovskyi took charge of a USSR national team, who failed to get through 1982 World Cup’s second group stage on goal difference, with the intention of leading them through the qualifiers for 1984 Euro and 1986 World Cup. Lobanovskyi, a former engineering student at the Kyiv Polytechnic Institute, immediately replicated the systematic approach he utilised with Dynamo. For him, football was a system of two systems including 22 sub-systems, interacting with each other in a playing area. That complex approach was born early in 1967, when he was the manager of Dnipro and met the sports scientist Anatoly Zelentsov of the Dnipropetrovsk Institute of Physical Science, who became Lobanovskyi’s assistant and introduce him to this path through the math. His USSR teams strictly followed these guidelines: they were essentially a team built around two lines of four. Working in a 4-4-2 shape, they were usually concerned about the space they had to cover. Lobanovskyi was a strong believer of the idea that the best way to overcome rivals is to manipulate the size of the playing area, making the field larger when in possession and smaller when defending. In order to do that, full-backs and wingers usually provided width by moving upfield. One of the basic USSR’s attacking approaches was built upon quick counterattacking combinations between both forwards Igor Belanov and Oleh Protasov. Due to Protasov’s explosiveness, they were highly effective to progress through the opposition defence. The Soviet defenders often enjoyed some degree of freedom in the initial build-up, and they exploited that well by accurately hittinh long-range passes over the opposing back line. The long balls were accurate to move the ball forward and to throw Protasov and Belanov into the final third of the pitch. Possessing two quick players with great playmaking qualities upfront was a key to USSR’s counterattacking play. The most important aspect of Lobanovskyi’s philosophy was the way his teams were working in defence. Faithful to his above mentioned principles, the Ukrainian manager wanted his side to make the field smaller. Always emphasising on the fitness of his players, Lobanovskyi enabled his sides to produce intense pressing over the course of 90 minutes. At the same time, as mentioned, it was not rare to see his teams sitting back and counterattacking. Those dividing concepts were linked by his fundamental idea of making out the way an opponent intended to play and then finding ways to destabilise the opponent. It was part of Lobanovskyi’s scientific approach. Therefore, he utilised a variety of defensive strategies during his tenure, e.g. he played man-coverage against Ruud Gullit when USSR beat the Dutch 1-0 in their opening game of the 1988 Euro. 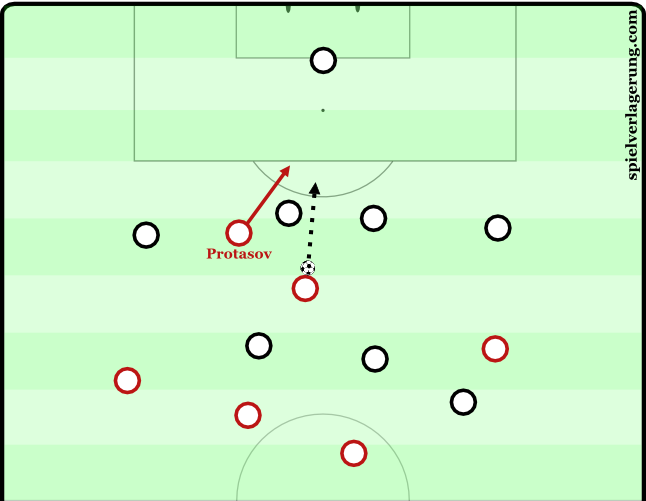 Facing the Republic of Ireland in the second group match of the tournament, Lobanovskyi again changed his formation, implementing a defensive low block to contain Jack Charlton’s long-ball style. With Ireland leading 1-0 at half time, Lobanovskyi re-modeled his squad, once again, with the Soviet Union increased pressure leading to Protasov’s score. USSR’s Gegenpressing and defensive transitions was effective too during this tournament. The diagram below shows how USSR capitalised on Glenn Hoddle’s mistakes during their 3-1 win over England in the 1988 Euro group stage. Lobanovskyi’s team pressed the opposition right after losing possession in the final third of the pitch, with Sergei Aleinikov regaining the ball and rushing through the England defence to finish past goalkeeper Chris Woods. Those examples above show Lobanovskyi’s brilliance that made him one of the most valuable football coaches of the 20th century. Unfortunately, it wasn’t enough to beat the likes of Van Basten, Ronald Koeman, Ruud Gullit, and Frank Rijkaard in the final. Adherent to his principles of players’ interchangeability, Lobanovskyi approached the final replacing suspended centre-back Oleh Kuznetsov with midfielder Aleinikov. It did not work. Igor Belanov’s missed penalty also didn’t help. Looking past their class of 1988, Lobanovskyi’s side lost a big opportunity. This team was ahead of its time, and they played the same kind of pressing game that Barcelona and Bayern do right now. During the final years of Communism, Lobanovskyi perhaps showed the most intriguing example of football collectivization, prizing team’s collective over the individuals. In the same way Karl Marx’s intended to create a collective society, Lobanovskyi regimented his squad, modeling a group of 11 individuals into a well-working unit in which every player perfectly understood his team-mates’ positions and movements. There was no space for luck or accident in Lobanovskyi’s vision. USSR played some of the best football in 1986 tournament before being dumped out by Belgium after controversial 120 minutes. At the 1988 Euro, USSR were among the favourites and displayed their best performance when they met the Netherlands in their group stage encounter. However, Rinus Michel’s Dutch side took revenge in the final. Marco van Basten’s amazing volley simply put a fleck of dust into Lobanovskyi’s intriguing mathematical approach. By the way, in this on-going age of Moneyball football, it is difficult to not appreciate Lobanovskyi’s modern football approach. If you omit Lobanovskyi and Kiev players references, I could think this article is about Simeone’s Atleticos. Great article! Can You also make an analysis of Lobanovskyi’s main ideological enemy – Konstantin Beskov and his Spartak Moscow? Believing to its former players and fans, Spartak was like Eastern Barcelona. Great article! Thank you! An analysis of Valeriy Lobanovskyi was long overdue. Thanks for this analysis of a football legend. Material on him and his teams is comparatively difficult to come across and he made a tremendous contribution to the sport. I’ve recently started watching Dynamo Kyiv games from the 90’s era champions league and you can see the elements mentioned in this article present in his tactics. There is mixture between zonal and man orientations and the team is incredibly intense in all of its actions. Defensively they tended to play in one half of the pitch, in the games against Barcelona (4-0 at the Camp Nou and 3-0 in Kyiv) they sat deep, engaged only in their own half and pressed furiously man to man in midfield. In the rare moments that they fully pressed (once or twice in Barcelona but more frequently in Kyiv) the entire team worked in the opposition half, there was no element of the team being broken even in a strategic sense. I have a soft spot for teams from Eastern Europe and Soviet Era teams, this is because they are quite mysterious and don’t tick the commercial or superstar boxes that elements of modern football are marketed on. This Kyiv team was a true collective and it’s quite odd that the national team didn’t really qualify for any major championships considering that bar one or two players originating from Belarus the entire 11 was Ukrainian. Shevchenko said that Lobonovskyi made him as a player and I can certainly understand why. Would it be possible for this site to do more retrospective analyses on him and his teams? Either that or a more detailed trainerportrait? This guy is a legend!